Completed the Mentalist Ritual at Aonir's Blade. Rallied all possible companions to your cause. Learned how to summon Titans. Freed all the prisoners when escaping from the Grey Keep. Brought a tribute to the God-King. Gave more than the bare minimum when asked for help. You fulfilled a task for the Elder Dragon. Escaped the Grey Keep with a new ally. Helped all of the Refugees in Farlorn's Hope. Sided with the Deathmen in Aonir's Blade. Sided with the Iron Falcons in Aonir's Blade. Claimed Mulandir as your base of operations. The fate of Nortander lies in your hands. You annoyed the composer by muting the ingame music. You were killed by peaceful wildlife. Got your first level up. Reached hero party level 20 in the campaign. Reached the maximum hero party level in the campaign. Defeated the Nortander army in the Iskander Wilds. Unlocked the human faction and upgraded it to the maximum. Unlocked the elven faction and upgraded it to the maximum. Unlocked the orc faction and upgraded it to the maximum. Defeat a human opponent in PvP. Played the campaign together with a friend. If only real life were as simple as that. Those prisoner clothes really look good on you. Played a practice skirmish match against the AI. You were killed by a tiny spider. That's actually pretty impressive. Defeated the Orcs in Farlon's Hope without producing extra units. 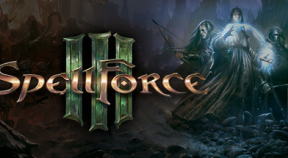 Beat the SpellForce III campaign. Gained the allegiance of the Wayfarers. Gained the allegiance of the Morhir Elves. Gained the allegiance of the Orcish Firewielders.